eBay Powered by Frooition About us Shipping Returns Contact us Our Reviews Promotions Mortal Kombat XL Shop Categories Helpful Links Add to Favorite Sellers Sign up to Newsletter View Feedback Contact Seller Visit seller's eBay Shop About Seller Page Mortal Kombat XL Item Description Mortal Kombat XL offers the ultimate Mortal Kombat X experience that includes the main game and all content featured in the Kombat Pack 2. 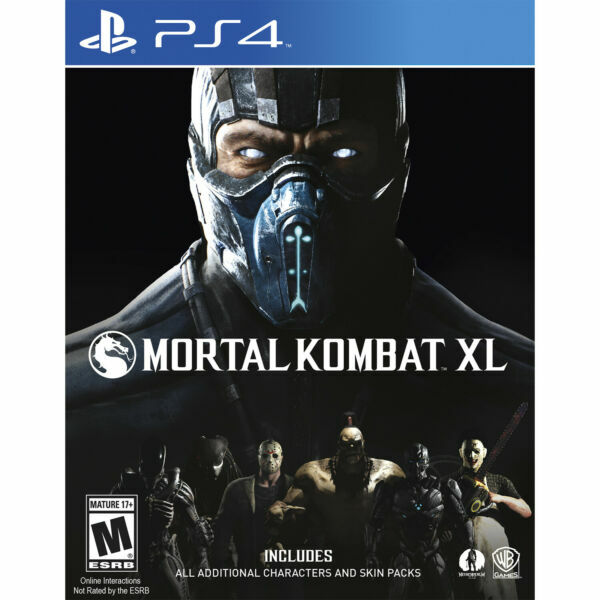 Mortal Kombat X is NetherRealm Studios' most recent installment in its legendary, critically acclaimed fighting game franchise that propels the iconic franchise into a new generation. The game combines cinematic presentation with all new gameplay to deliver the most brutal Kombat experience ever, offering a new fully-connected experience that launches players into a persistent online contest where every fight matters in a global battle for supremacy. For the first time, Mortal Kombat X gives players the ability to choose from multiple variations of each character impacting both strategy and fighting style. Players step into an original story showcasing some of the game's most prolific characters including Scorpion and Sub-Zero, while introducing new challengers that represent the forces of good and evil and tie the tale together.Features:Mortal Kombat XL offers the ultimate Mortal Kombat X experience that includes the main game and all content featured in the Kombat Pack 2:Brand new playable characters the Xenomorph from Alien, Leatherface from The Texas Chainsaw Massacre horror film series, Triborg and Bo'Rai Cho.Never released Apocalypse Skin Pack.Previously released content including playable Goro, Brazil Skin Pack, Kold War Skin Pack and Kold War Scorpion Skin.Also included with Mortal Kombat XL, previously released DLC from the original Kombat Pack:Playable characters Predator, Jason Voorhees, Tremor and Tanya, with each accompanied by three themed skins.Samurai Skin PackNote: All DLC is included on the disc and it is not a separate download code.Game Variation:Actual product received could be slightly different than what picture shows. To clarify the main photo may show the standard edition but you could actually receive the Greatest Hits, Platinum or a store specific version e.g. Walmart exclusive or Best Buy exclusive. Game Manuals Certain publishers have opted not to include physical manuals. If you do not find a manual please visit the publishers website for a digital version. You May Also Like More Items!View more great items Video Games Game Consoles Accessories Toys 2 Life Last Chance About us Shipping Returns Contact us Our Reviews Powered by Frooition Frooition | No-js Template | eBay design, eBay store design, eBay shop design, eBay template design, eBay listing design (ver:froo_no_js) This listing is currently undergoing maintenance, we apologise for any inconvenience caused.